After joining Stratovarius 23 years ago Timo Tolkki did not expect to achieve the sales of 2,5 million records, a Finnish Grammy and 3 Gold Discs with his band. In the the renowned American “Guitar World” magazine, Tolkki has been ranked the 27th fastest guitar player in the world, as well as placing 84th of the 100 Greatest Metal Guitarists of All Time. He is the pioneer in creating a highly copied Stratovarius production sound producing all the Stratovarius albums and also was pioneering together with his bandmates the genre of melodic and symphonic power metal that generated a whole generation of new bands that paid a tribute to his band. After writing over 120 songs and playing over 1200 shows with Stratovarius, Timo Tolkki decided to stop the band in October 2007 because of the very bad internal situation, chemistry and lack of motivation of the band. In a dramatic move he gave away all his rights to the entire catalogue of Stratovarius, including all the rights to the name he owned for his ex bandmates as a protest to them from surprising notification that they would continue without him as Stratovarius. Tolkki recorded an album called ”New Era” and named the project ”Revolution Renaissance”. This highly acclaimed melodic metal album includes performances from such legends as Michael Kiske and Tobias Sammet. After the Stratovarius turmoil, Timo Tolkki was not sure if he ever wanted to have a new band or tour again. After some months and the good response of ”New Era” everywhere, he decided to carry on and started to search for permanent members for his new band. And ad in his myspace resulted in over 2000 applications from all over the world. Among these people Tolkki chose the new members based on their personalities and life views and of course their playing skills. Enter Gus Monsanto (Vocals), Bruno Agra (Drums), Mike Khalilov (Keyboards) and Justin Biggs (Bass), this new band is a mixture of different nationalities and youthful energy. Some of the bands these new musicians have played before include names such as Adagio and Aquaria. In March 2009 “Age of Aquarius” was released wordlwide through JVC and Scarlet Records. It’s a dark and symphonic and yet melodic record full of drama and passion. In the end of July 2009 the band signed a 3 album deal with Napalm Records and a new longplayer is expected for 2010. 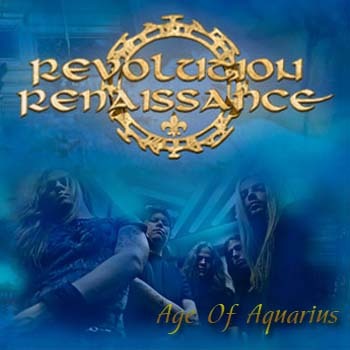 Revolution Renaissance cherishes the legacy of Timo Tolkki’s songwriting which contributed 95% of Stratovarius material in 23 years he lead the band. Paradise, Season of Change, Father Time, Black Diamond, Hunting High and Low, Kiss of Judas and Forever among other songs have left Tolkki’s trademark Stratovarius sound and songwriting in the history of melodic symphonic power metal. Revolution Renaissance will continue his songwriting legacy with a new energy, enthusiasm and attitude. On a sadder note the band has also bad news for you. They have parted ways with the bass player Justin Biggs and the keyboard player Michael Khalilov. During the recordings of “Age of Aquarius” it became evident to everybody that RR was not the right band for the guys. Justin is more of a trash guy and Mike expected the music to be something totally different. Out of these reasons the decision has been made that it is better to go seprate ways. Both are great guys and the remaining members Timo Tolkki, Gus Monsanto and Bruno Agra wish them well and best of luck on their musical endeavours. Check out the new album of Mike’s band Empyreon from iTunes and Justin’s band Descend. The remaining members have been writing songs for many months now and you can expect the follow up to “Age of Aquarius” sometime next year.